BBC Radio 3's World Routes programme has announced a new release date for their double CD set of previously unreleased material: 'World Routes: On The Road'. This will be a 2CD set recorded by the BBC Radio 3 programme World Routes on location over the last 10 years. It features some of the biggest names in world music, including Grammy award-winning Toumani Diabate. 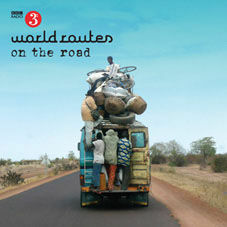 World Routes is the BBC's flagship world music show listened to by around 100,000 radio listeners in the UK on BBC Radio 3, and millions across the globe via the the BBC World Service. Since the autumn of 2000, World Routes has broadcast sessions and live concerts with a complete "Who's Who" of world music artists from Youssou N'Dour, Ladysmith Black Mambazo and Khaled, to Mariza, Caetano Veloso and Ravi Shankar. However, World Routes is not just interested in the stars of world music, but is also on a mission is to travel to the most far-flung corners of the planet to document and – in its own small way – preserve endangered musical traditions. In the past 10 years, the programme's producers and sound engineers, along with presenter Lucy Duran and a team of guest presenters, have left the comfort of London's Broadcasting House in search of real roots traditions. To date, the programme has visited some 53 countries, including 15 in Africa, 15 in Asia, and 9 in the Americas. 'World Routes: On The Road' is a 2CD set of previously unreleased material recorded on location over the last 10 years and featuring some of the biggest names in world music including Grammy award-winning Toumani Diabate, Tito Paris and Ilham Al Madfai, as well as many less familiar names. Artists from countries as diverse as Mali, India, Iraq, Georgia, China, Madagascar and Cape Verde all have tracks featured on the CD set. The album has been co-produced by World Routes presenter Lucy Duran, who is also a Grammy-award winning record producer responsible for 'Segu Blue' (2007) and 'I Speak Fula' (2009) by the acclaimed Malian ngoni virtuoso, Bassekou Kouyate. The deluxe 2CD digipack comes with a 44-page booklet featuring notes and photographs from Lucy Duran and the production team. Lucy's passion for travel and music started early on - she spent the first two decades of her life living pretty much out of a suitcase while the family lived in Chile, the USA, England and Greece. Schooling was a little irregular, but music was a constant, and was eclectic and exciting - at home she listened to anything from Bach to Andean music and flamenco. She packed her bags once more and went to study with Amadu Bansang Jobarteh, a Kora maestro in the Gambia, and from there, went on to Mali, where she began working with various artists including the young virtuoso Kora player Toumani Diabate, producing his first seven albums, including Kaira and New Ancient Strings, both now considered landmark albums of the 21-string West African harp. In the 1980s, while working as a curator at the National Sound Archive, Lucy began to present occasional features on traditional music for Radio 3, and even had a crack at presenting Radio 4's Kaleidoscope, a brilliant exposure to live radio and a sobering reminder that world music was her real forte. She joined the School of Oriental and African Studies (London University) in 1992 as Lecturer in African Music, and since then has been going backwards and forwards to Mali researching the music of its flamboyant divas, receiving her doctorate in 1999. World Routes saw the light of day as a weekly programme in September 2000, with Lucy as its regular presenter, and since then she's been lucky enough to travel around the world recording features on location in places as diverse as north Vietnam and Peru. Meanwhile, she continues to produce albums, leaning towards the more rootsy side of world music, such as 'Mano suave' by Sephardic singer Yasmin Levy (2007), 'Kassi Kasse' by Malian singer Kasse Mady Diabate, and most recently, 'Segu Blue' (2007) and 'I Speak Fula' (2009) by the acclaimed award- winning Malian ngoni virtuoso, Bassekou Kouyate and his band, Ngoni ba. James Parkin has been at the heart of world music broadcasting at BBC Radio 3 for the past 11 years, producing shows such as Andy Kershaw, WOMAD, Late Junction and World on 3. He is the Series Producer for the flagship programme World Routes, which has just celebrated its tenth anniversary, and was Senior Producer for the recent critically acclaimed Music Planet series. He has travelled to over 50 countries with his work at the BBC, with highlights including North Korea, Iran, Turkmenistan and 13 African countries. He has developed a unique network of fixers, musicians, and festival organisers around the world, many of whom feature, one way or another, on this collection.